We offer guaranteed success in 70-432 through the use of 642-642 practice question and other 640-863 materials. is there any single .deb file ready to install in ubuntu? I haven’t found one so I made this guide. But the steps above worked in Ubuntu Jaunty. that is very nice…. 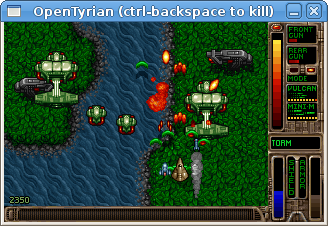 another game in linux…..
Be sure to try Chromium B.S.U too. Is it the same version as yours that you compile from source ? The requested URL /svn/classic/trunk/ opentyrian was not found on this server. @ubu-fan: the version on Softpedia is older than the one I have. I checked out the latest SVN branch. Worked for me. Maybe when you tried it the server was down, updating or the maintainer just modified the SVN tree to something else. …using Mercury set of tools (apt-get install mercury). @T4L – nice blog with clear instructions and a good game, I played it the first time tho. @Sergio – Thanks for the update. And I added the -fgnu89-inline to the EXTRA_CFLAGS +, @ line 26. This successfully created the opentyrian binary. I got it working on my 10.10 ubuntu. Now I need a starter….